The consumer brand is listed in the ‘Website of the Year’ category at the DANI Awards and the ‘Digital Project of the Year’ category at the Digital DNA Awards. The DANI ‘Website of the Year’ award recognises websites that epitomise fantastic design, great user experience and most of all websites that have helped achieve business growth. The Digital DNA ‘Digital Project of the Year’ award recognises teams that have delivered a major digital project which has had an impact on the wider business. Kitchen Stori enlisted the expertise of digital agency, Eyekiller, to design and implement an intuitive new website to help build the brand and generate new business for its network of approved kitchen retailers throughout the UK & Ireland. 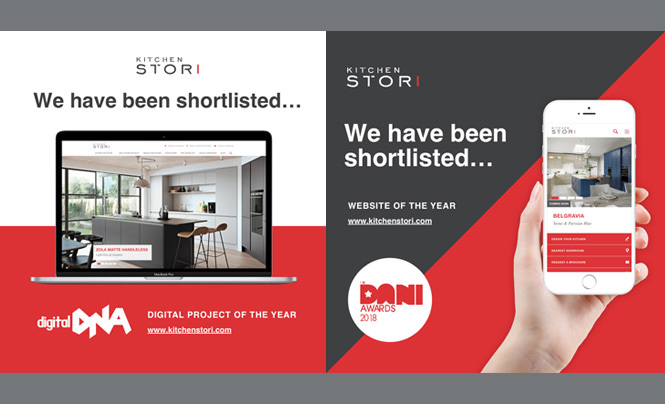 Ursula O'Dowd, Digital Marketing Executive for Kitchen Stori says, ‘We’re very excited to be named in these prestigious awards and be recognised among some big brands. We’ve worked with Eyekiller for a number of years now and they really understand our business, the market which we serve and the direction of the company in terms of our growth strategy. Since launch in October 2016, the website has overachieved significantly in terms of engagement and lead generation and we’ve received very positive feedback on the overall user experience it offers. We wish Eyekiller the very best of luck in both finals’. The DANI Awards take place on 13th April at Whitla Hall, Queens University and the Digital DNA Awards take place on 26th April at St.Anne’s Cathedral in Belfast.